Click on image to visit HBS Senior Living Week home page. 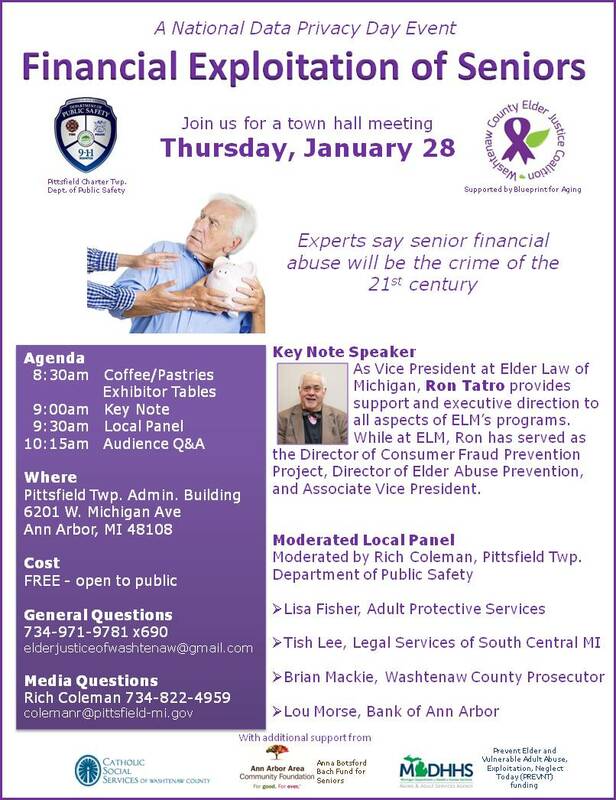 Financial Exploitation of Seniors Town hall meeting held January 28, 2016. Click on image for event info. 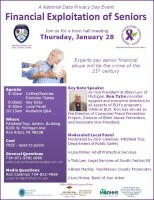 The Blueprint For Aging, in association with the State of Michigan and the Paraprofessional Healthcare Institute, offered a free one-day training on preventing abuse and neglect of older adults. The curriculum was designed to equip Direct Access Staff (which includes direct-care workers, caregivers, and others who provide services and support to older adults) with the skills needed to prevent, identify and report adult abuse and neglect – with an emphasis on prevention through staff empowerment, person-centered care and skill building. People who work with older adults (60 or older) in home- and community-based settings, including volunteers. The training took place on August 26th at the Washtenaw County Learning Resource Center (4135 Washtenaw Ave, Ann Arbor) from 8:30 a.m.-4:30 p.m. Lunch and a morning snack were provided for attendees. The Blueprint for Aging (in collaboration with the Chelsea Senior Center & Chelsea Retirement Community) hosted an information session on transportation options for older adults in Western Washtenaw County. The info session was held in the Dancey House Theater at Chelsea Retirement Community. Worried about maintaining your independence as you age in Washtenaw County? 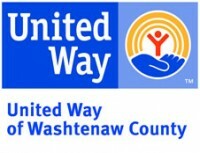 Senior Services, a division of Catholic Social Services of Washtenaw may be able to help. For over 30 years, NSS has been helping older adults find reliable and affordable assistance with home maintenance, home injury prevention, access ramps, and transportation. Call 734-712-7775 for information and check out our webpage at http://www.nssweb.org. The Blueprint for Aging strives to create and maintain positive community change to increase quality of life and independence for older adults and their allies in Washtenaw County through a community collaborative process. Please feel free to leave feedback or comments using this form!